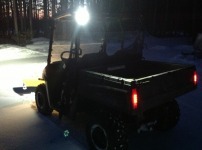 We took a Polaris Ranger 500 UTV that is used for plowing snow and added 3 of our round 4.9" LED spot lights to give a better field of vision while plowing. We installed 2 facing forward and one to the rear for backing up. 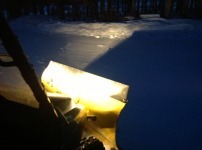 The typical problem when plowing with any truck or ATV/UTV, is that with the plow on it blocks off much of the headlights on the vehicle. We have a couple of pictures to show the stock headlights and then the LEDs on to supplement the forward vision. 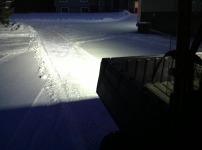 This picture shows the added LED spot lights and how they shine all around the front. 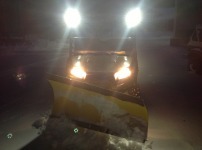 Notice how the plow cuts most of the headlights off and just hits the plow, making it very difficult to see. 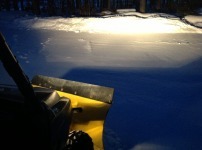 Here is a picture to show how we installed the 2 LED lights facing forward. Here is how the rear mounted LED unit was installed. We only used one here to give some light when backing up. This picture shows the area lit up by the rear facing LED. Really helps when backing up.